Imagine being transported to a magical land called The Dordogne. A land of Fairytale castles, medieval villages. Towns with narrow winding streets and ancient houses, vineyards producing fine Bergerac wines, painted caves and other sites that take you back to the beginning of man. Combine this with the rivers Dordogne and Vézère and countryside so beautiful that it will take your breath away. Exclusivity is guaranteed. As only you and your guests at a time will live in our charming château, dating back to the 11th century. 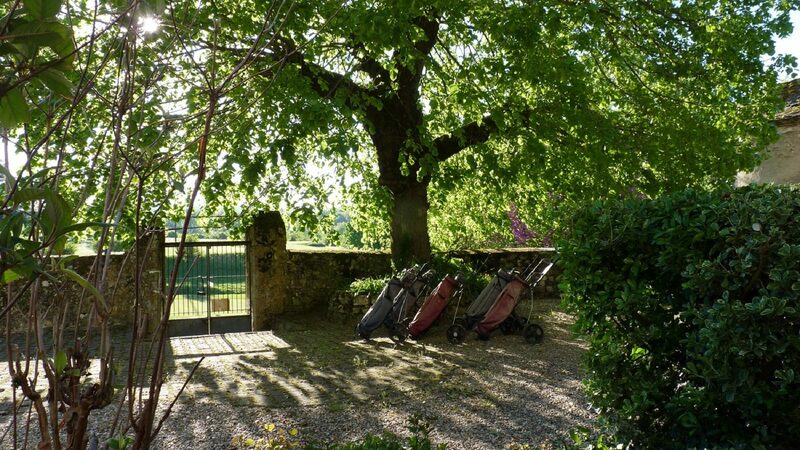 All the facilities of Château de Sadillac will be for you and your family to enjoy as your home for a week. Chateau de Sadillac has luxurious bedrooms with en-suite bathrooms, a living and dining room, large kitchen and a private bar will add to the comfort of your luxury stay during your holiday in France. Sipping your drink while watching the sunset from the terrace overlooking the golf course. Relaxing by the swimming pool at the end of the day will provide you with the opportunity to reflect on the treasures you have seen that day, and anticipate the pleasures still to come. Château de Sadillac offers you: Holiday rental accommodation up to 15 guests, private 9 holes par 27 golf course, heated swimming pool and a finish sauna. Exclusive use of the accommodation and facilities, like the golf course with its attractive 9 hole 27 par approach, beautiful pool, fishing lake, trampoline, huge chess game, children’s play corner, table football, wood-fired pizza/bread oven, barbecue etc etc. There are 6 luxury bedrooms, 3 en-suite and 3 shares one big bathroom, huge living room with wood burner, comfortable couch, television, DVD. Huge kitchen, fully equipped with an oven, gas cooker, microwave, toaster, coffee machine, fridge, freezer, washing machine and dishwasher. There is a bar, with an extra fridge and entrance to the huge terrace with awning, overlooking the golf course. Through the bar, you can also enter the spacious second sitting/dining area on the ground floor. Château de Sadillac has a private golf course, 9 holes, 27 par with an attractive lake, set in 8 acres of undulating fairways. The shortest distance is 90 meters ( Tee nr 1 ) the longest is 135 meters ( Tee nr 6 ) the lake is part of the game, 2 tee’s are crossing the fishing lake, so bring a lot of golf balls with you. It is a compact par 27 approach course ideal for improving one’s game or for the ambitious beginner or the children. The private golf course is exclusive for you and your guests, no entrance fee or starting time. There are several halve sets available even for the children. 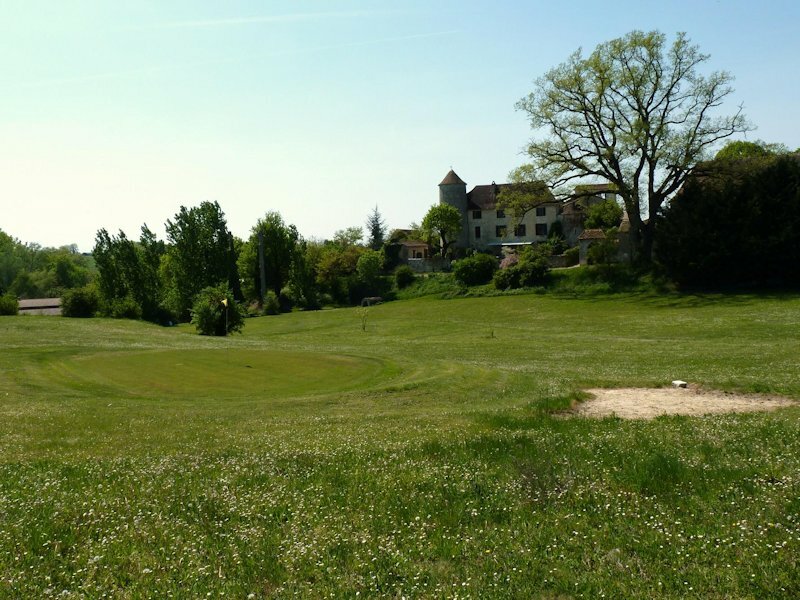 For the keen golfer, several other golf courses are in the Dordogne region, most golf courses are within easy reach, for instance, the famous championship course at Château de Vigiers (18 hole par 72 and 9 hole par 36). Other golf courses in the neighbourhood are the Golf and Country Club Villeneuve (18 hole par 72, 9 hole par 31). Château Les Merles (9 hole par 36). For groups up to 15 guests, Château de Sadillac offers you an exclusive holiday accommodation for your family or families, group of friends. The château with its golf course and pool are there just for you. Exclusive use of the facilities, like the golf course with its attractive 9 hole 27 par approach, fishing lake for the kids, trampoline with safety net, huge chess game, children’s play corner, table football etc etc. Romantic, quaint Château, dreamlike terrain with a challenging beginner golf course.